Most pieces that I have chosen to present are similar to those found in major private collections and museums. 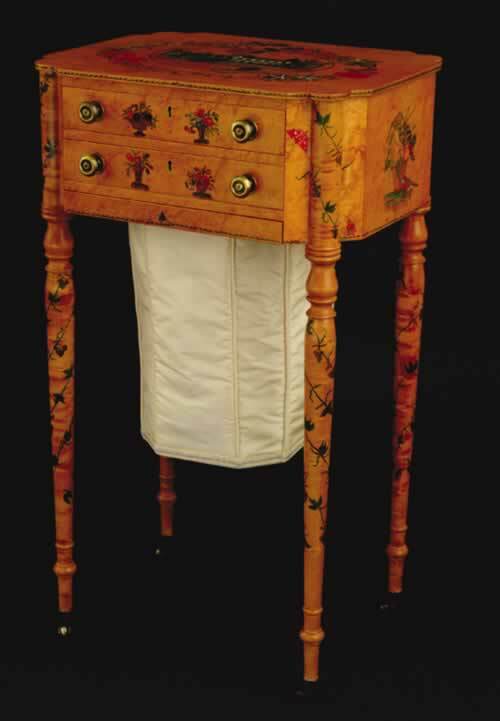 I take my responsibility to represent the painted furniture of American school girls very seriously, and have done whatever I can to reintroduce them as accurately as possible. Everything from the furniture materials, methods of construction, choice of period hardware and fabrics, to the final hand rubbed finish have been carefully chosen. The ten cabinetmakers that collaborate with me all chose the piece(s) that they enjoy creating. These rare craftsmen are more than cabinetmakers. They are outstanding artisans whose skills have been driven by a passion to succeed in creating exceptional traditional American work. The shellacs, inks, paint palette, their pigments and binders that I use, represent the materials available to the students 200 years ago. I strive to choose motifs, designs and script that incorporate the essence of the young women's work. The one major change that I have made is in the final finishing of each piece. The fragility and undependability of the older finishes in protecting the art work has made it necessary to now use the finest contemporary hand rubbed finishes that give the older appearance but are much more durable. My finisher-cabinetmaker takes great care and pride in every single piece that his hands touch. My greatest wish is that my work will bring back to life , this small piece of our creative history ,and reinvigorate it as an art form once again! My upholsterers have worked on many authentic antiques similar to my representations for many years now. Outstanding major collectors , museums and auction houses know and use this exceptional shop. They have an extraordinary breadth of experience and knowledge of the correct upholstery techniques and materials appropriate for each unique sewing table.